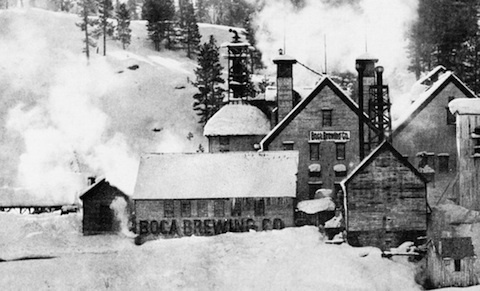 Boca Brewing Company first brewed a lager in the winter of 1875-76. Photo courtesy of the Verdi History Center, Verdi, Nevada. Anchor Steam® Beer’s roots date back to the sundry and mysterious adaptations and improvisations of brewers to the primitive conditions they faced during the California gold rush, long before icehouses and modern refrigeration made traditional lager beer a viable California option. The inaugural brew of the Anchor Brewing Zymaster™ Series is our attempt to re-create such a beer. So, you ask, what does Zymaster mean? Leading off the Zymaster™ Series is our own California Lager, which is brewed from the finest California two-row barley, Cluster hops (the premier hop variety in 19th-century America), our own lager yeast, and mountain water. This fresh take on a classic California brew is, quite simply, re-discovered gold. Our California Lager is also a single-hop beer, using only fresh, whole Cluster hops, all descended from an old line originally grown in California. Cluster has a long history as a “dual-purpose hop” for both bittering and aroma, which creates a flavor profile like no other. In part two of our introduction to California Lager, we’ll look back at the history and origin of the beer style, including the California breweries that gave California Lager its name. Is California Lager bottled and widely available? Where can I find it? Hi Dan, Thanks for your question! The California Lager is available on draught only and will be featured at various events and accounts around the San Francisco Bay Area during SF Beer Week. Damn, do I miss California! I began drinking Steam when I was 17 (1978) and could buy it at Trader Joe’s for $4.99 a six-pack. Happily, we have Steam, Porter, Old Foghorn, Small Beer, and Holiday out here in KCMO. Keep it up, Anchor.